That's my exact situation as well. My two least favorite teams facing off against each other with the worse of the two going for an undefeated season - this is a nightmare. I always said I was glad I wasn't alive for the 1986 World Series, but this might be just as bad. I like the Giants; I like that Eli so far in the playoffs has pretty told most critics to go screw by having some good games and taking care of the football (for the most part) in the most important portion of the season. My problem is that I really hate the Dolphins and as a Bills fan growing up didn't really care too much about the Pats as they pretty much sucked. The Dolphins however with that a** Marino pissed me off regularly. As such; for the Patriots to take over the perfect season record with 19-0 with the most prolific offense in NFL history would be a pretty sweet victory. I will however be taking the Giants and the points if the spread exceeds 7; that Giant defense is swarming. My two favorite teams playing in the Super Bowl. I'm really torn. I wish the Pats had lost a game along the way because now I want to see a perfect season...but not at the expense of my childhood team. Teams have had their chances vs the pats in the last 6 weeks or so...Baltimore wins if not for a bad Time-out, the Eagles put up a hell of a fight with a back-up QB, the Giants had a lead until Sam Madison went out of the game, the hapless Jets only gave up 1 offensive TD after a blocked punt, and SD kept the game close with 3 main guys either playing hurt or not playing. The longer you leave a team in a game, the more they start believing in themselves. Belichick will have the Pats ready with some new wrinkles...he's the best in the biz with 2 weeks to prepare. It will have to be Spags' finest job. Take Randy Moss out of the game and they have a chance, albeit a small one. Ahmad Bradshaw did not play in week 17. He will hopefully play a key role for the Giants. I hope its a good game. The patriots are my second favorite team too..partly because it's nice when the b/f and I root for the same team, they are in the AFC and I will always love Belechick because it was the giants where he first had success and I'm happy he's come so far..I would root for the Pats against anyone but the Giants -- they are my team and have been since childhood.. I really hope it doesn't get ugly in a war of words this week between these two teams...I'm not sure how Harrison got involved with the Packers comments about the Giants, and I know Pearce's intentions with his Brady comments, but it didn't come across that way..hopefully these two teams take the high road. Ya gotta b-ELI-eve! Go Giants! Cant wait for this Super Bowl! Go blue!! I'm not a Giants fan, but the Cheaters defeating a NY team to complete a perfect season* would just be the cherry on top of the $hit sundae that is New England's new found sports dominance. I am not looking forward to the network parade ESPN is going to throw for the weeks afterwards. On the other hand, wouldn't a Giant win over the Pats be the perfect "monkey wrench" to throw into Boston's plan for American sports dominance? Imagine the Giants avenging the Yankees for the 2004 ALCS? [FONT=Franklin Gothic Medium]We do not see things as they are. We see them as we are. I know, which is why this Jet fan will be in their corner. But the only way this game could avenge for 2004 is if the Cheaters blow a 5 touchdown lead in the 4th quarter or something. And Eli Manning runs off the field with the Lombardi Trophy in one arm and Tom Brady's supermodel girlfriend in the other. Anyone notice the guy standing under the upright to the right pointing off to the left. 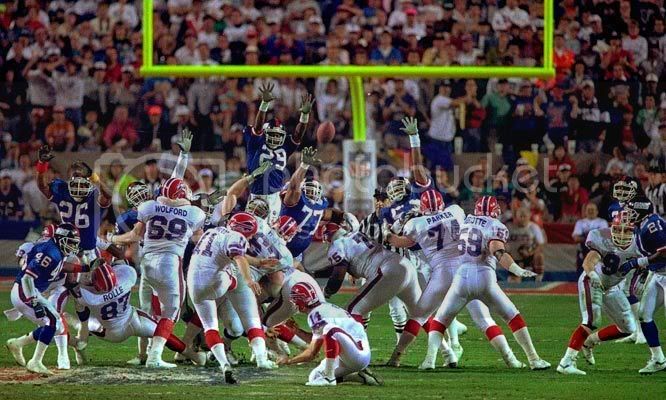 It's one of the most dramatic moments in NFL history. What the heck is he doing? "HEY JIMBO, LOOK AT THAT THERE CHEERLEADER! Wait, what's happenin'?" Was he bored by that game? Unless he was pointing for the ball to sail that way. Still entertaining after all these weeks! I'm not a Jets fan who hates the Giants, so I'm quite happy to see them where they're at. I love Favre, so I would have like to see the Packers win... however the idea of bringing the Boston/New York rivalry to the SB could be all sorts of awesome. Yes, the Giants/Pats aren't a rivalry at all, but with Spring Training around the corner, this is going to be really cool. I think my explanation is more fun . I'm hearing on the radio that for the Modells in Stamford, CT, there are more Giants stuff moving than Pats stuff. I don't know if Stamford is on the NE side of things or not, but I'm glad that another NY/NJ team can have a following over there. Now let's hope that the game is great and half-time is also great. Commercials, anyone? Coolness. Everytime I see a NJ resident telling me that "their team" (the Pats) did great, I ask them if they have any NE connection. School, work, whatever. None. Just a bunch of bandwagoners, that's all. I haven't watched the Jints since Parcells, LT & Carson were here, but I at least root for the home team. Stamford is practically NY City. A lot of people who work in Stamford live in NY and commute to work there. It's that close. Stamford is in the little panhandle of CT and couldn't be much more than 10 minutes from the NY border. Southwest CT is pretty much NY team territory from what I gather. It's a 45 minute drive... it's pretty much NY terriotry. It's about 45 from the city, but it's basically just over the state line is what I meant. BTW, the YES studios are in Stamford. I didn't know that the YES studios are in Stamford. But yeah, it is over the state line and I was just adding information for other people.